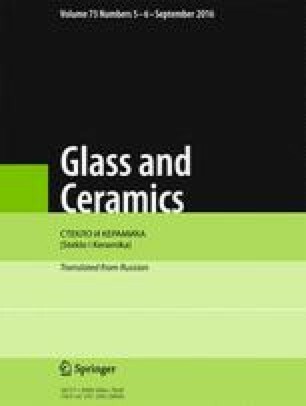 Laser glass was synthesized using a phosphate base with different Nd3+ concentrations, whose composition ensures high glassmaking properties and the possibility of obtaining in small crucibles optically uniform glass. The basic spectral-luminescence characteristics of the obtained glasses are determined and it is shown that this matrix ensures long duration of luminescence and high quantum yield in a wider range of Nd3+ concentrations. Taking account of the good melting and pouring properties this matrix composition is helpful for development work on new laser materials with a modified luminescence band owing to activation by different rare-earth elements and modification of the matrix by highly polarizable cations. Translated from Steklo i Keramika, No. 5, pp. 9 – 14, May, 2016.